From San Diego to Singapore, they came by the thousands to paint, plant, clean, clear, build, renovate, weed, recycle, learn, design and teach their way to safer, healthier, more efficient schools. The third annual Green Apple Day of Service, which took place Saturday (Sept. 27), deployed hundreds of thousands of volunteers into 3,760 service projects in all 50 states and in 42 countries throughout the world. In K-12 classrooms around the world, students joined in events to improve their schools. 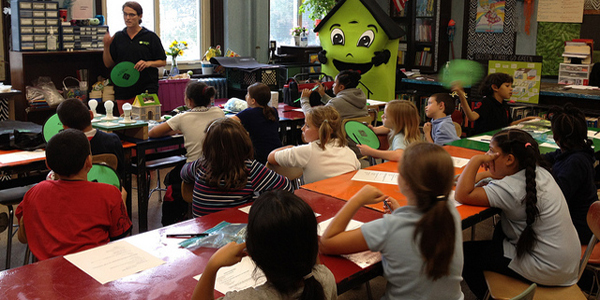 An initiative of the Center for Green Schools at the U.S. Green Building Council (USGBC), the Day of Service brings together students, teachers, parents, elected officials, organizations and companies. The annual event underscores Green Apple's rallying cry: "Where we learn matters." This year’s flagship event was held in Washington, D.C., where U.S. Secretary of Education Arne Duncan and his family joined volunteers at Tubman Elementary School for gardening and painting projects. The school also hosted sustainability education activities for students and families. "At the Center for Green Schools, we’re continually inspired by the dedication of local communities and volunteers to improve the places where our children learn,” said center director Rachel Gutter. “On this third annual Green Apple Day of Service, we couldn’t be more humbled by the sheer volume of activity to transform our schools and communities. Hundreds of thousands of volunteers around the globe are sending a clear message that where we learn matters. Students from Jordan joined those from more than 40 countries in events. Hundreds of other cities and towns hosted a variety of service activities. In Chicago, volunteers at the John M. Smyth Magnet and IB World School built new garden boxes, weeded existing gardens, and created a restorative space for students. Students at Cristo Rey Jesuit High School in Atlanta updated the community garden, participated in a school-wide clean up and recycling initiative, launched an environmental awareness program and encouraged student-led “trash-to-treasure” recycling projects. The school also created a mural representing the school's motto of environmental sustainability. In New Orleans, the Center for Sustainable Engagement and Development is renovating a 130-year-old barge board house into an environmental education and visitor center. The third annual event saw 3,760 service projects in all 50 states and in 42 countries worldwide. The site will give visitors the ability to peek into the construction and see the types of energy efficiency upgrades that have been made to the house, serving as a model of energy efficiency and as a neighborhood hub in the Hurricane Katrina-stricken Lower 9th Ward community. In Mexico City and Guadalajara, students at the five campuses of Instituto Thomas Jefferson made personal commitments to sustainability at their school and took action in support of recycling, habitat restoration and water conservation. A student trip to review waste management practices in Bangalore. "At the Center for Green Schools, we’re continually inspired by the dedication of local communities and volunteers to improve the places where our children learn,” said the director. "Many of today’s schools are beset by a host of challenges that compromise our children’s health and wellness, causing everything from asthma to headaches and concentration issues," the campaign says. 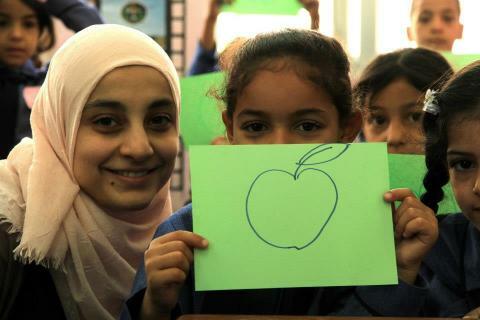 "Green Apple is a global movement to put all children in schools where they have clean and healthy air to breathe, where energy and resources are conserved, and where they can be inspired to dream of a brighter future." 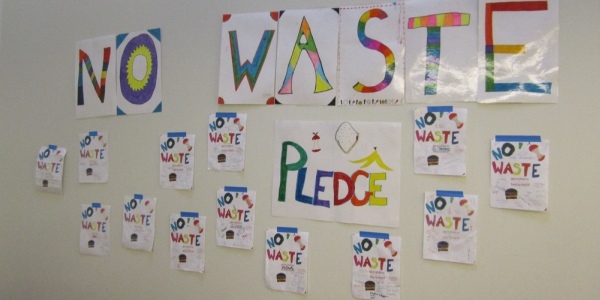 Ironic to see the "NO WASTE PLEDGE" sign apparently having been laminated (note the high gloss visible on the STE, along with wrinkle pattern on the E characteristic of laminating with rollers slightly too cold) - making it unacceptable for virtually all paper recycling. And this will improve declining math, language and science scores how? "‘Many of today’s schools are beset by a host of challenges that compromise our children’s health and wellness, causing everything from asthma to headaches and concentration issues,’ the campaign says." I grew up in schools where I developed asthma thanks to the mold growing within the walls...is there an initiative to fix mold growth and purify air? I don't see how a garden, with plants lasting the months students have off from school, will improve education, health and wellness of the student body or faculty of any school. I think we've gone "green happy". I'm not saying that environmentally sustainable schools aren't important, but I'd rather see my children have healthy lungs and a clean air learning environment than a mold-ridden school with a fantastic garden. Additionally, we learn everywhere; so I hope the effort goes deeper than a single day of school-based activities to protect the environment each year.